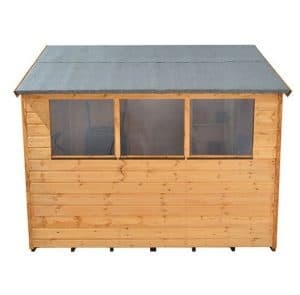 With an attractive look like this, you would expect the Hartwood 8′ x 6′ FSC Apex Shed to be a shed that costs over £500, but that is not the case at all. 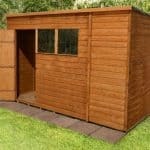 This is a shed that shows you can have an elegant and high quality style and still keep the price very reasonable. Offering you a very nice amount of storage space to make use of and a very friendly design. 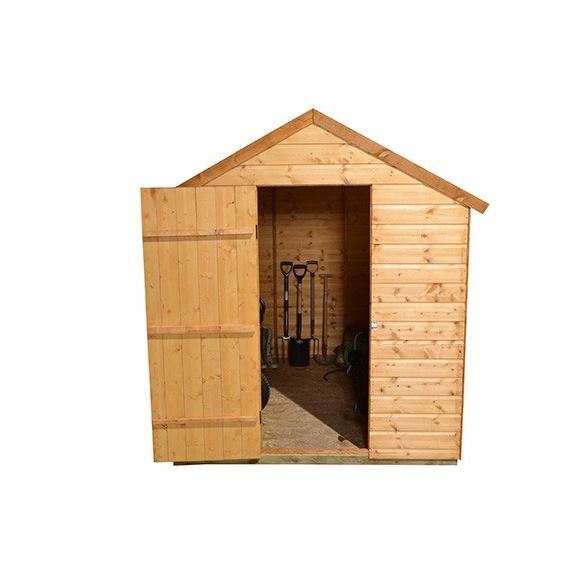 This is a shed that is going to provide you with plenty of storage space to keep all of your tools, kids toys and gardening equipment safely tucked away. 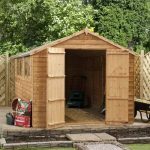 The fact that this is also one of the most attractive and eye catching sheds on the market right now is one very welcome bonus and something that is going to make this a shed you just love having in your garden. 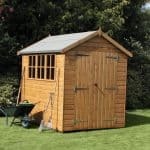 Even though this is a shed that is very good looking, it is still incredibly strong and long lasting. The tongue and groove shiplap cladding is an impressive, 12 mm thick and backed up with a very robust frame that makes the whole structure very solid. Both the floor and the roof are made so that they keep out water and are also strong, meaning the floor can handle the weight of all of your heavy items and the roof will be able to take anything the snow and rain can throw its way. 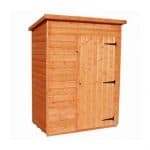 The Hartwood 8′ x 6′ FSC Apex Shed offers you a very classy and good sized place to keep your gardening items, tools, kids toys and those little items that are spilling out all over the house and you have been told they either find a home or are going to the dump. This is one very elegant looking shed, and at 8 feet deep and 6 feet wide, you will have a very ample, but not vast amount of storage space to make use of. 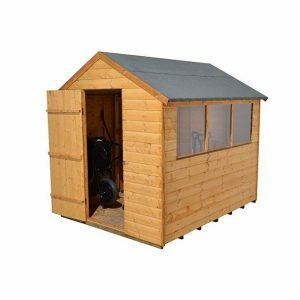 While the storage space offered is very decent, the shed is not oversized so you do not have to worry about this taking up a ton of space in your garden and actually even smaller gardens should be able to house this shed. Along the ridge the shed stands at an impressive 7 feet high so you do have plenty of headroom inside here making pottering around not require you to be hunched over. One of the first things that you notice about the apex roof is that lovely green mineral felt. This is actually far more heavy duty than you would think and you do not have to worry about this tearing in the wind. Under the felt is some rather solid, solid sheet boarding that is strong so it is able to take the weight of lots of snow if we get a brutal winter. It is the cladding which sets this shed apart from the other similar sized sheds. Using 12 mm thick tongue and groove cladding not only makes this a shed which is water and wind tight and also very strong. The cladding is so tightly locked together that it really does make it impossible for water to get in inside. 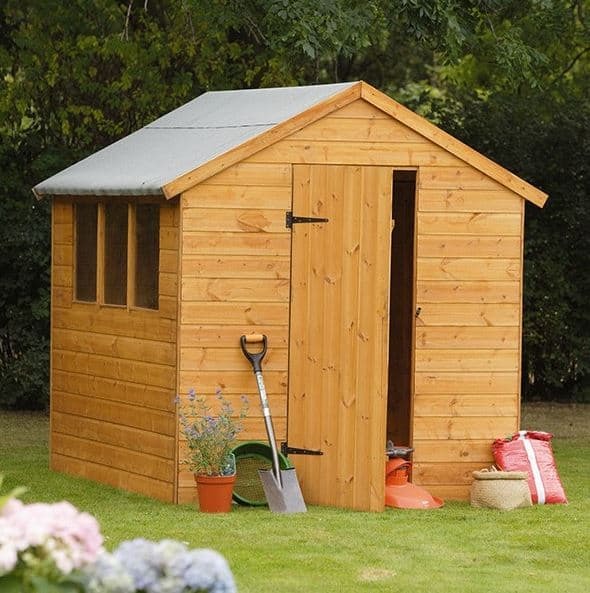 It also makes it one very smooth and classy looking shed that you just want to rub your hand along. Inside the shed and right behind that cool looking cladding, we have a frame that is 28 mm x 28 mm. This is something that actually made us raise our eyebrows and give an approving little hmm sound as this along with the cladding makes the shed very strong and long lasting so you are going to be able to get many years of use out of this shed and even 10 or 20 years down the road it will still be just as solid as the day you built it. Walking inside the shed is going to feel good and you will not be worried about storing your more heavy items inside of here. The flooring is made with solid sheet boarding and is supported with some impressive floor joists which give you a floor that is not just strong, but also a good few inches high so it is not sitting directly on the ground below it. 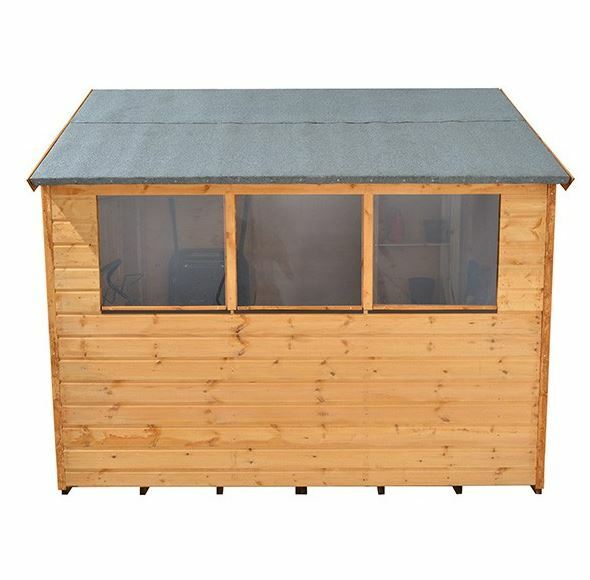 The Hartwood 8′ x 6′ FSC Apex Shed does only come with a very basic form of wood treatment, which is going to only keep the wood protected for a short period of time, so you will want to get a good tub of wood treatment and give the shed a generous coating shortly after you have installed it. Once a year a new coating should be applied, you do this and we can assure you that you will never have any issues with rot or decay. As long as you do treat the shed on a regular basis and look after it in the right way, you will be given a very fair and generous, ten year anti rot guarantee. On the front of the shed we have a single door. Now we do feel that they could have easily put a double door on the front of this, but to be fair the door they have used is a decent size. 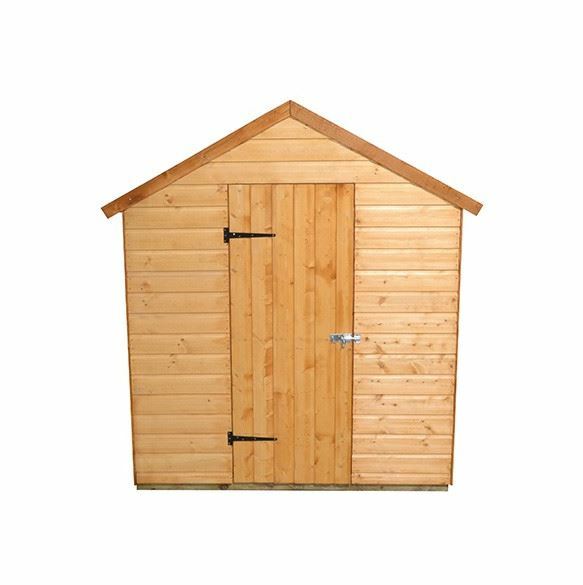 At 2 feet 2 inches wide and 5 feet 5 inches high, we do not see you having any trouble getting things inside the shed. Structurally the door is fine as it is supported on the back with three strong braces and secured to the frame of the shed with two heavy duty hinges that will ensure even your moodiest and hardest slam will not see the door suffer. On one side of the shed there are three fixed 1.2 mm thick shatterproof styrene windows. Seeing three windows on here was something that really did impress us as it really is going to make sure the shed gets plenty of natural light. While we would have liked one of these windows to be an opening window, we do understand their reasons for making them all fixed. 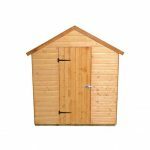 While some of the pictures do show the shed with a turn button catch, we can assure you that actually this shed does come with a pad bolt which is a great little bonus as it will stop the door from flying open in the wind. With the way the shed is made, especially that cladding and the frame, in general this is one very secure and strong shed. 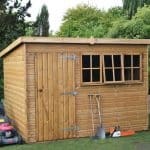 Even with the generous amount of windows this is a shed which, depending on where you place it in your garden, can still offer you a lot of privacy. Of course if you have it so the windows are facing the street or the neighbours houses then the will be able to see all the cool stuff you have, but placing the shed so that the windows still let in natural light, but do not advertise all of your belongings is something that we are sure many of you will want to do. If you are limited as to where in your garden the shed can go then you could always just add some curtains or blinds. Clearly as you can tell from the first picture this is one very nice looking shed. But as you do need to give it a coating of wood treatment anyway, we do suggest you at the very least have a little think about using a wood treatment that is coloured. The first extra that they have for you to consider is perfect if you want to add some security to the shed. For £19.99, you can get a very high quality Yale Hasp Steel Black Finish 120 mm & Brass 40 mm Padlock. Depending on the surface you are installing the shed they also offer a plastic shed base for a cost of £119.99, but to be honest with you unless you are really worried about installing the shed on grass then this is not something to consider adding. That smart looking cladding and impressive frame really do make this one of the more high quality, under £500 sheds that we have seen. This is a very well made shed and not only are the materials used very strong they are also going to last many years as well. You will need to give it a little help once a year with a new coat of wood treatment, but this is all the TLC the shed needs in order to give you many years of use. While, 8 x 6 is not what we would call a large shed, it still can be a lot of storage space if you really take care when you are storing things and maximise the space offered. Without a doubt this is something you will want to get a friend to help you with, but to be honest it is not going to cause you too many headaches. On average we would say that 4-6 hours is a good time for a shed of this size. 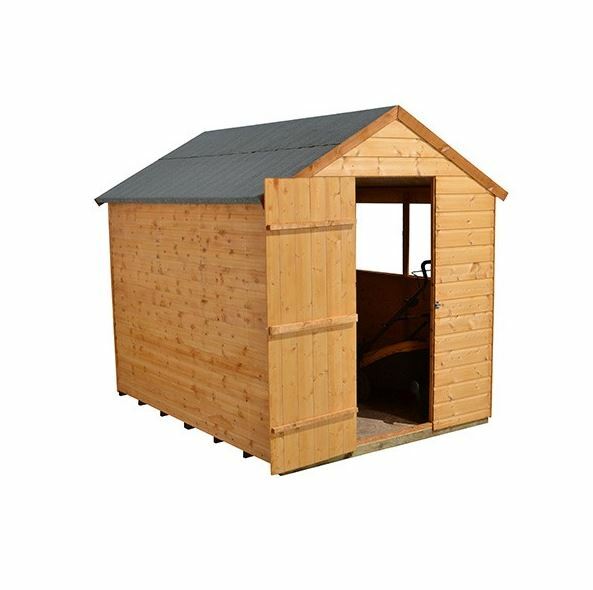 We really like this shed and while you can get similar sized sheds for a lower price, we feel that the tongue and groove shiplap cladding, strong frame and overall design make this one worth the little bit extra money. Final Thoughts: We just love the way the Hartwood 8' x 6' FSC Apex Shed gives off such a strong first impressive. Its smooth walls and those three good sized windows really do give the shed a very classy and friendly kind of appearance. It does not have the rough and rustic type of look that other storage sheds have and as a result we think that it is just ideal for those of you who like to have nice things in your garden. The size may not be huge, but it certainly can go very far if you are smart with how you organise your belongings. 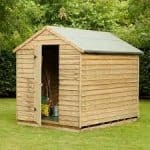 In all this is one fantastic shed that we are very impressed with and it is something that we find very easy to recommend to you.